I know I go on and on and on about New York being the greatest city on earth, but this week I must admit that Los Angeles has some **ahem** fine qualities as well. You're all familiar with the fabulous things that can be found beneath the sidewalks of Manhattan (and occasionally Brooklyn). 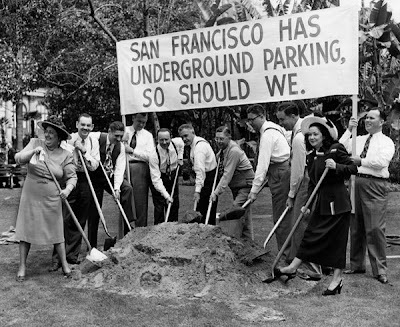 But what would you discover if you were to whip out a shovel and start digging under LA? Well, let's start with a mammoth skeleton, the skull of an American lion and bones of saber-toothed cats and ground sloths. 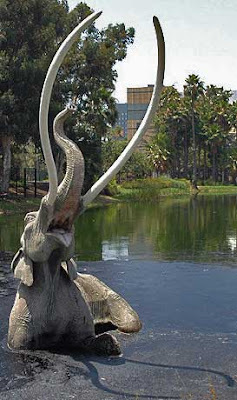 In 2006, construction workers were beginning work on a new underground parking garage not far from the famed La Brea tar pits (shown below) when they began making incredible discoveries--including a set of 10-foot-long mammoth tusks. The location, which had long been a run-down parking lot, was the site of an ancient riverbed where countless Ice Age creatures met their end. Paleontologists around the world must have wet their pants when they heard about the discoveries, which include everything from tiger bones to millipede fossils. Even more exciting? Who knows what could still be down there, hidden under the area's stores and streets. Somebody bring me a plane ticket and a shovel! Read more (and see some pictures) here and here. I've been to the La Brea tar pits. I accidentally stepped in tar that was coming up out of a hole in the sidewalk near the parking lot. It was awesome! Cool! I'm in LA as I type and I've been the the La Brea tar pits many times! Los Angeles is AWESOME! :P I knew that we had to have SOMETHING here worth discovering! I honestly dont think you talk about how cool New York is alot. (ITS IS!!) the only really cool city i've been to is New Orleans! I LOVE NEW ORLEANS. im realy upset cause there is no possible way there COULD even be an underground city there. you cant even have basements cause its so wet. a couple of feet and your SMOTHERD in water. But mardi gras (translated: fat tuesday- a day deticated to PARTYING!) is really fun. i have SO many Mardi Gras beads! In fact, its mardi gras now. i just said all that beacuse you people who are all fortunate to go to these wonderful places, realize how lucky you are! Oh my StarClan, somebody get me a shovel so I can go start digging in LA!!! Montana's pretty cool, too, though; here you dig up sapphires and T-rex bones. In colorado you huge sheets of rocks and thick clay. I went to the La Brea Tar Pits once, and they smelled awful!! Scientists say that LA was the most populated area in the dinasour - ish times. Personally, I don't find dinousars as fascinating as creepy, mysterious things like underground rooms. by the way, there's a really cool home that might be going on sale, a man who has remodeled a cave to become his dream home!!!!!! SO COOL!!!!! And which international octopus incident would you have in mind? Wow, my mom is gong to LA next week! I realize this doesn't exactly pertain to the subject at hand, but I found this online and I hope you'll be interested. It's this castle in Scotland that is almost completely graffitied! That is so AMAZINGLY cool! falcon, 1. really? and 2. I agree. When I was 4, I loved dinosaurs, though. Of course, it makes all the difference if they're fossilized tar pits, you know. Dakota Blue: people swim with sharks all the time on Discovery Channel. Look for the LA episode of Cities of the Underworld. There's a whole section on the underground Prohibition speakeasies. Are we going to have a three year anniversary contest? Cause last year I worked on my entry over vacation, and it's vacation now... so it must nearly be the 3 year anniversary of this blog. It'd be cool if we were having one, but it takes time, and you are busy, but I was just wondering. yes, rely on tv. Now, have you ever swam with sharks? If not, you have no right to judge me, or my shark thoeries. i have been to l.a. and had no idea about that... p.s. i read ur stories - AWESOME!!! "A couple of years ago, a friend of mine from New York got a job in Los Angeles. We were scared for him. heck, [i]he[/i]was scared for him. You see, the people in Los angelenos seem to have some crazzy ideas. For one, they seem to think L.A. is the center of the universe. Which is an offense to us New Yorkers because we [i]know[/i] N.Y. is the center of the universe. it talks about the tar pits inn the Neddiad by Daniel Pinkwater. I LOVE that book!! !